Bitcoin Price Prediction: Will BTCUSD Break the $6,830 Resistance? Bitcoin Price has been trading in a range-bound zone with low volume trades in the past one week. However, can traders expect the BTCUSD pair to break the $6,830 resistance zone in the coming days? Bitcoin is trading below $6,600 level, hovering at a 24-hour range of $6,536-$6,765. However, the upward trend has not been able to break above the resistance at $7,000. According to Coin Market Cap, the number one digital coin has a total market cap of $114.5 billion, while $4 billion in trade volume has passed through the exchanges. Bitcoin price experienced a slight recovery of +0.30% during yesterday’s trading session, rising above the $6,600 mark and pulling away from the descending triangle pattern. The price has moved by $71.45 with a total volume of over $2.25 billion in the last one week. The weekly high was at $6,806 on September 28 and the lows were at $6,333 on September 25. 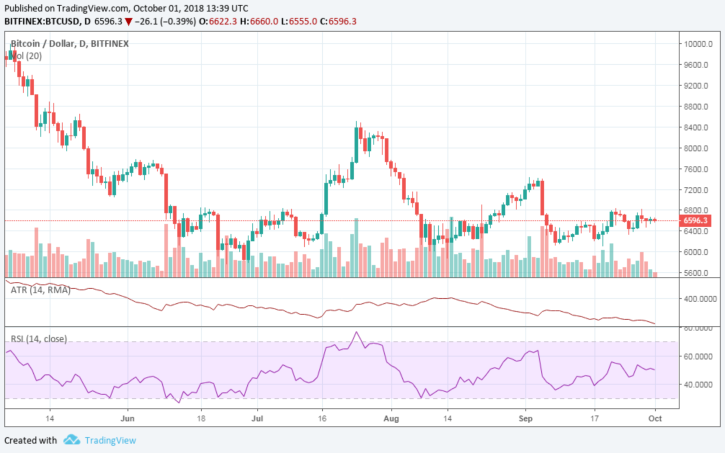 A look at the BTCUSD chart shows that the price has managed to pull away from the descending triangle pattern drawn from the beginning of the year. While there is stability in the crypto market, this will be short-term, at least until the outcome of the US SEC verdict on Bitcoin’s ETF applications. At the moment, the Bitcoin price support level is highlighted at $6,360 while the resistance closes to break $6,8,30. If Bitcoin closes below $8,500 level, we will rarely see a bullish rally that reaches historical highs even though it has managed to hold the price. The Relative Strength Index (RSI) (14) moves in the 50% line, while trade volume was low during yesterday’s session. However, we can expect it to change in the coming days as investors now trade based on the fundamental of ETFs. Additionally, the Bollinger Bands indicator is moving closer, which indicates the presence of lowering volatility. This also signifies that a breakout is imminent. Bitcoin bulls will be in charge if buying pressure continues. Although there are issues with weekend trades, a strong surge in Bitcoin price might be decided if trades above the $6,500 level. This, however, would not simply represent a trend reversal. This would be a break out of the $6,000-$6,400 psychological zones. Further, the Fibonacci retracement charts show that Bitcoin is awaiting a buying signal as the price is stuck between the 38.2% and 61.8% Fibonacci retracement zone. A push above this resistance zone is needed if we are to see a bullish rally towards $7,000-$7200. William%R signals the selling price action on weekly time-frame. MACD (12,26) – “Sell” signal in weekly charts. ATR (14) signals Bitcoin is less volatile. Bitcoin has a significant support highlighted at $6,360 and resistance is placed at $6,830.